Originating in the early 1990s, Water Sensitive Urban Design (WSUD) was proposed as a method of designing urban developments to encompass all aspects of the urban water cycle. It aimed to integrate the stormwater, potable (drinking) water, and wastewater cycles to minimise the adverse impact of development. • integrate water into the landscape to enhance visual, social, cultural and ecological values. 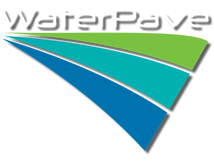 WaterPave is providing innovative Water Sensitive Urban Design ideas to Melbourne and all of Australia. Source: Dept. of Environment Resources and Management 2010.